Daqarta is in waveform (scope) mode by default, when neither Sgram nor Spectrum buttons in the toolbar are active. The input range, channel, and line selections are set via the Input Control dialog (the thin button beneath the Input toggle in the toolbar). The display magnification can be controlled via PgUp/PgDn keys, or by dragging the Y axis, or via the up/down buttons at the top of the axis. The Y axis reflects the current Input range and magnification, unless only the Generator (output) is active. 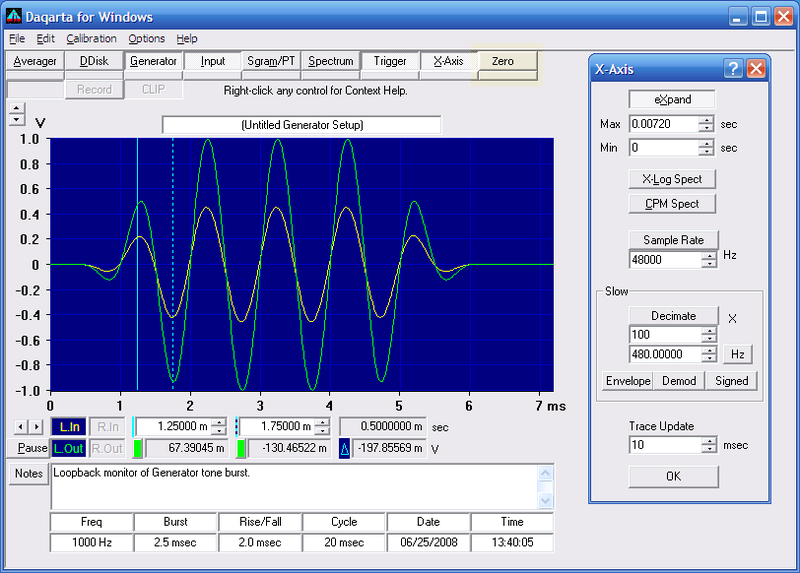 The horizontal (time) axis is determined by the sample rate and the horizontal expansion ( eXpand), both of which are set in the X-axis Control dialog (shown at right in the above image). You can also change expansion by dragging the X axis, or using the left/right arrow buttons at either end. Alternatively, hitting CTRL+ALT+X will cause the display to expand to the limits set by the solid and dotted cursors. The X-axis toolbar button (ALT+X) toggles eXpand off and on. Trigger Delay (in the Trigger Control dialog) slides the X axis to show the waveform at an earlier or later time than the trigger event. The X axis labels always show the actual time relative to the trigger. The Trigger Control dialog also allows complete control over level and slope, as well as holdoff and hysteresis for difficult trigger situations. You can chose from Normal or two types of Auto triggering for any signal. If you use the Generator to produce a stimulus signal, the Gen Sync trigger mode allows triggering on features of the stimulus (like FM modulation) that might otherwise be impossible with conventional triggering. The cursors (solid and dotted vertical lines) can be dragged via mouse, moved via the left and right arrow keys, or set directly (or by macro command) to any X value via the X-position readouts below the trace area. At the right is a readout showing the difference between X values, here 0.500 msec. Note that inputs and outputs must be calibrated before the readouts can show true values. Daqarta includes an auto-calibration feature that scans through all mixer attenuator settings to perform a relative calibration, so you only need to perform an absolute calibration on a single range. This can be as simple as measuring one input or output level with an external voltmeter. Daqarta also provides independent settings for external gain, so you can use preamps or power amps without having to recalibrate. You can set user-defined units and conversion factors for any and all lines, which can be easily toggled on and off via menu or ALT+U. This allows direct readout of force, current, luminosity, or whatever units you choose, instead of Volts.